The Emerald Necklace Trail passes through about 5 miles of the Cuyahoga Valley National Park, where it shares trail with the Ohio & Erie Towpath Trail. The following notice only applies to this section within the CVNP. CVNP, OH - From nps.gov/cuva, "Because of the federal government shutdown... Trails and roads will remain open. Restrooms and visitor facilities will be closed. For more information, see www.doi.gov/shutdown." Facilities: In the parks along the route. Worth Noting: Wider tires might not be a bad choice to smooth out your ride on older, rougher trail sections. 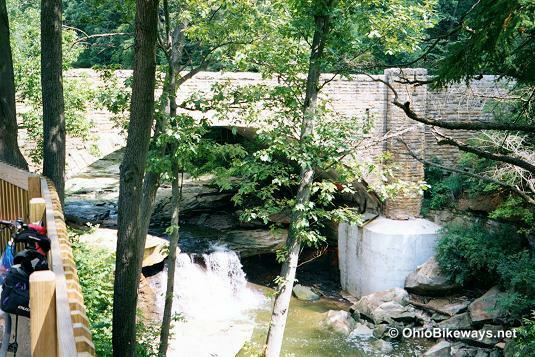 The Cleveland Metroparks refer to their trails as 'All Purpose Trails' and make no distinction between the trails that form the Necklace and other metroparks trails. Meanwhile, Google Maps uses generic terms like 'Valley Pkwy Trail' for the eastern portion of the Necklace, so it can be confusing for visitors. Just remember that the All Purpose Trails in the Cleveland Metroparks system that form the necklace, is the Emerald Necklace Trail. The individual metroparks in this trail system are known as "reservations." While many form the Necklace, others are separate or form offshoots, like the Big Creek Reservation, which is also linked by trail. The scenery is quite beautiful along much of the bikeway. It seems that every few hundred yards or so there is something to catch your eye. Vertical hillsides scattered with rocks, mammoth-sized highway bridge trestles, trail bridges over rivers, soccer games and family picnics -- the sights are numerous and varied as you make you way through the parks. Miles logged can add up quickly here. We puzzled over how our ride approached 100 miles over two days. With sag support, we didn't have to double back, so an extra 30 miles over the Necklace's reported 70-mile length seemed extreme. We later realized our ride included an out-and-back ride to the Big Creek Reservation, some short excursions exploring a few spurs, making some wrong turns, riding an unnecessary loop at the South Chagrin Reservation... it all added up. But we could still only account for about 83 of our 96 miles logged. It's safe to say that you can expect to ride more than the advertised mileage here, particularly if you're not carrying good maps or navigation apps! The condition of this huge trail network can vary quite a lot due to the periodic resurfacing of older segments and the occasional addition of new segments or spurs. So the surface runs the gamut from poor to excellent condition, while the width of the trail is also subject to change with many older sections being narrower. We started at the northwest end of the bikeway at the Rocky River Reservation in Lakewood at Detroit and Sloane Avenues. Entering the reservation you descend into the Rocky River Valley which is at the bottom of a deep ravine. The paved trail snakes along between the Valley Parkway Road and the river, which accompany you on your ride. The trail travels through wooded areas and over and along several hillsides. This allows for some natural obstacles on the trail surface. Extreme caution is recommended when riding after a heavy rain, particularly in the fall when wet leaves and nuts can be a real hazard. Mud slides are also possible in some sections. The Emerald Necklace Trail is not a rail-trail and therefore it is not a flat or straight bikeway. At times the trail winds its way along much like a snake's track in the sand. These snake-like sections challenge your riding skills by taking you up and down small hills and through an assortment of curves of varying degrees of sharpness. Here the asphalt path can be narrow at only 8' wide, which makes negotiating the terrain while passing other trail users rather dangerous, due to compromised sight lines. So it's important to understand that this is a leisure trail intended for pleasant slow-speed rides through wooded areas. That's why road bikes are out of place on the trail. Most trail riders use mountain or hybrid bikes, while the roadies take to the Valley Parkway which parallels the trail. There they can pickup more speed and ride in more of a straight line. As of October 2018, the western section of bikeway is now one continuous asphalt path from Lakewood, at the start of the Rocky River Reservation, to the Brecksville Station and the Towpath Trail in the Cuyahoga Valley National Park, a span of ~32 miles. This was accomplished with the construction of the 6-mile Valley Parkway Connector Trail in 2017-2018, which closed the final trail gap on the western half of the necklace. If you're inclined to explore the new Lake-to-Lake Trail that connects Lake Abram and Lake Isaac, you'll want to turn north onto the trail at the Big Creek Parkway. Exploring the entire Big Creek Reservation trail adds about 15 trail miles (7.5 up and back), while exploring the Lake-to-Lake path will add another 5 miles to your Necklace adventure. 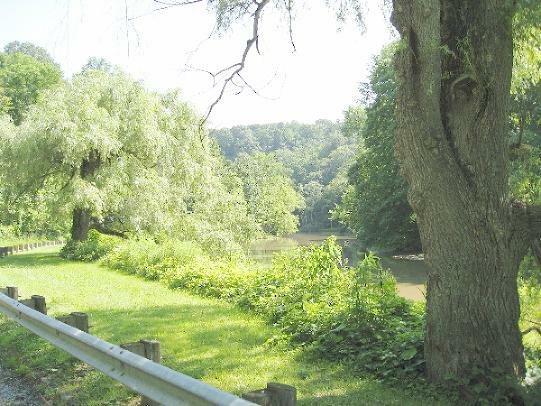 We found the road riding along the parkway to the Brecksville Reservation to be pleasant. The posted speed limit of 30 mph, along with the courtesy displayed by local drivers, made the ride a lot less scary than riding on a rural highway or busy city streets. If you're used to riding flat trails, however, the Emerald Necklace will test your fitness. Though the trail does have some flat sections, most often you'll be climbing or descending in and out of the valley or along its hillsides. As with any large trail system, there are a number of connecting paths that you'll encounter, many not signed. So at times you won't be sure which is the main trail. Sometimes a marker will tell you where a spur goes, but you won't know how far the trip is. We managed to pick the wrong path a number of times as some spurs have been added over the years and signage was not helpful during our visit. Fairly accurate maps are a must if you want to stay on the main trail. You can try a decent app on your cell, but it's also wise to have an offline option in case reception is poor or your battery runs low. Continuing east on the trail through the Brecksville Reservation and across Riverview Road, you'll soon find yourself at the Station Road Bridge Trailhead of the Ohio & Erie Canal Towpath Trail in the heart of the Cuyahoga Valley National Park. In fact, to continue northeast along the Necklace, you will ride a 2.7-mile portion of the Towpath Trail here at its 17-mile marker point. The railway station and trail bridge make a pleasant, scenic spot for a break or kodak moment. And of course, the railway station is a stop for the Cuyahoga Valley Scenic Railway. We found the Cleveland Metro Parks system to be quite impressive. There seems to be something for everyone: a park road with a low speed limit for road cyclists, a paved trail for rollerbladers (on newer segments), a snaking trail for leisurely bike rides, a bridle trail for horseback riding (which also follows the river along with the parkway and the paved trail), and of course, traditional facilities like ball fields and pavilions. Let's pick up our journey at Station Road Bridge at the Cuyahoga Valley Scenic Railway station. You'll find restrooms and water here, as well as a nearby kiosk with a map of your location. There are several "you are here!" maps throughout the reservations along the route. However, unless you take your own maps or are familiar with the area, you may miss out on the bigger picture that includes the O & E Towpath and the Akron Bike-Hike Trail, both major trails in this area. To see the close proximity and trail connections, check out the Western Emerald Necklace map. Parking lots abound along the trail and restroom facilities should not prove hard to find. Continuing north on the towpath, the trail surface alternates between fine crushed stone and old asphalt segments as you make your way along the old canal route. You'll soon pickup the Bike-Hike Trail trail crossing the road. Turn left and take the trail north to Alexander Road where the B & H ends and the Emerald Necklace continues on through the Bedford Reservation. From this point the trail is pretty much a continuous path from the Bedford Reservation through the South Chagrin Reservation, with one short jog at Richmond Road. Much of the South Chagrin Reservation trail segment is made up of a large loop. 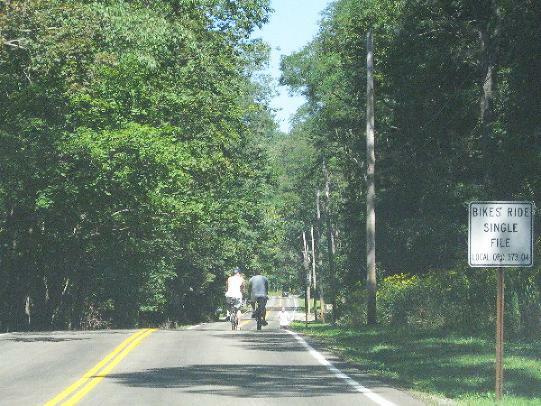 We missed our turn at Chagrin River Road and rode the loop by mistake. After doubling back, we were on course once more. Take Chagrin River Road north (includes a quick jog right on Old Mill Rd, then left again on Chagrin River Rd) to Wilson Mills Road where you turn left and soon pickup the North Chagrin Reservation on your right. We found the road route to be bike-friendly and about 10 miles long. North Chagrin Reservation provides a spunky climb, followed by some riding along an abandoned road before returning to trail. We finished up at the Strawberry Picnic Area, about a mile from the trail's end near Chardon Road. The trail is mostly tree-covered as the bikeway moves through the green belt that defines the park system. You'll pop out into the sun from time to time along the parkway roads, but more shade is never far away. The same holds true for facilities and water, though you'll still want to know some of those locations in advance. And don't forget, there's plenty of climbing! One of the most appealing things about the Emerald Necklace Trail has to be the fact that 2 other major trail systems have direct connections to this trail. The Ohio & Erie Canal Towpath and the Bike & Hike Trail add many more miles of trail riding options. With easy connecting points to both of these trails, it's truly trail-riding heaven! And when you include the Ohio-to-Erie Trail, which shares the towpath here, you are connected to Columbus, Xenia, Dayton and Cincinnati by trail as well. How awesome is that?! Are there differences between the eastern and western portions of the Emerald Necklace? Definitely. The eastern section is hillier. The climbs are often steep and/or long. The trails in this section seem to be climbing or descending in and out of the river valley in a crisscrossing fashion. The Cleveland Metro Parks trails system is truly unique. Not only are there traditional park facilities, but bridle and paved trails with river views and beautiful scenery. Add 2 more major trails to this mix and... well, what more could one ask for?